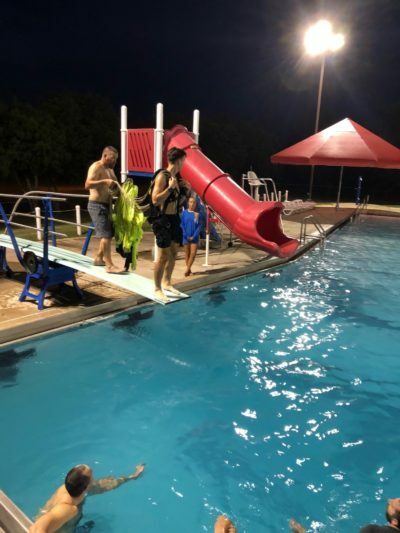 Water training was a huge success Saturday night at the pool! We trained 10 jumpers for their “B” license and had a total of 54 people participate! What a great way to finish off a hot July Saturday of skydiving! 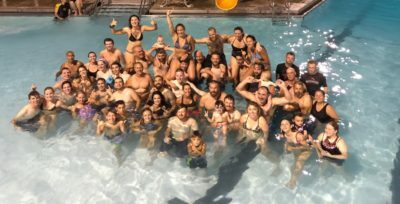 We partnered with our local water park to rent it out after hours for the training and then we just had lots of fun cooling off after a hot day! Lots of jumpers brought out their kids and families for the fun! Water training is required for skydivers to qualify for a “B” License with the USPA. Some of the stuff we go over is how to cut away the canopy in the water, getting out from under the canopy and lines if it lands on you, and also how to get out of a skydiving rig while in the water. Many dropzones around the world offer skydiving near large open bodies of water and that requires a minimum of a “B” License to skydive there. Skydiving is all about education and safety to keep all jumpers safe, and we encourage all of our jumpers to learn everything they can about our awesome sport! 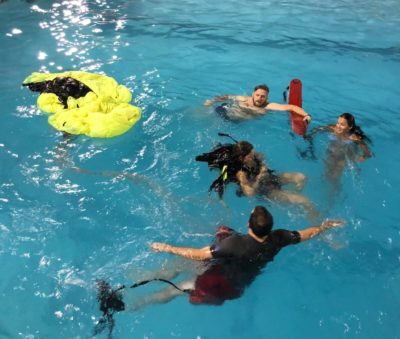 As with all skydiving training we do at Oklahoma Skydiving Center we covered some the information and then we get everyone involved in the hands on training in the water. It can be a little intimidating at first, but the equipment floats surprisingly well in the water making it easier to get out and get away from all of the lines and fabric. We have skydiving training classes for first time skydivers every Saturday come out and see what all the talk is about! Ready to Fly? Learn More about ACCELERATED FREEFALL STUDENT Skydiving at OSC!